Finding that special someone is not an easy task. You may try out all different types before you settle on one, if you settle at all! This Valentine’s Day treat yourself (and possibly a romantic partner) to your favorite type of kale. There’s more than one you ask? Yes, yes my friends, there is more than one type of kale. Each type is exactly how we like ‘em – rich, health conscious, and the talk of the town. Curly Kale: At the top of the popularity chain, it’s known for its distinct qualities. A little ruffled around the edges, but easy to chop when fresh. Some like ‘em younger, and we can’t blame them! The older they get the more bitter to the taste. Yeah, you can say that again. Lacinato Kale (aka Dinosaur Kale): Don’t be turned off by the slightly wrinkly and firm touch. It is sweeter and more delicate than the curly kind, and holds its texture even after a match with the frying pan! These dark blue-green leaves may be the match for you. Red Russian Kale: It’s always blushing, but can you blame it? Its red and purple leaves are often described as sweet, yet mild, with a bit of peppery-ness. Be sure to avoid its stem though. Unless you’re looking for a stomach ache – it’s hard to swallow! Redbor Kale: Last but not least, is the most colorful of the bunch. Known for its looks, the deep red and purple leaves make for a great trophy plant! Yes it is edible, but it doesn’t hurt to sit and stare at each other before bringing out the cutting board. Be sure to test out each type before making any hasty decisions. You’ll never know what you’re missing out on, unless you step out of your comfort zone! 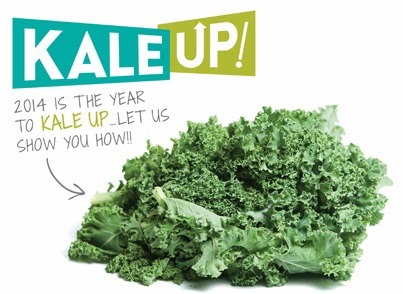 KALE UP!